A Secret Island in the Gulf of Thailand? When most people think of islands in Thailand, they think of Phuket, and then Ko Samui and the gorgeous limestone cliffs of Ko Phi Phi. Party-goers will probably think of the wild all-night full moon raves on Ko Phangan, while divers will think of the crystal clear waters of Ko Tao. Next down the list are Ko Samet, a popular retreat for Bangkok Thais, followed closely by Ko Chang, which still has idyllic charm. However, I know of an island that is only a two hour trip away from Bangkok that barely ever gets mentioned, yet it offers a lot of interesting scenery and history. That island is… (drum roll please)… Ko Sichang. 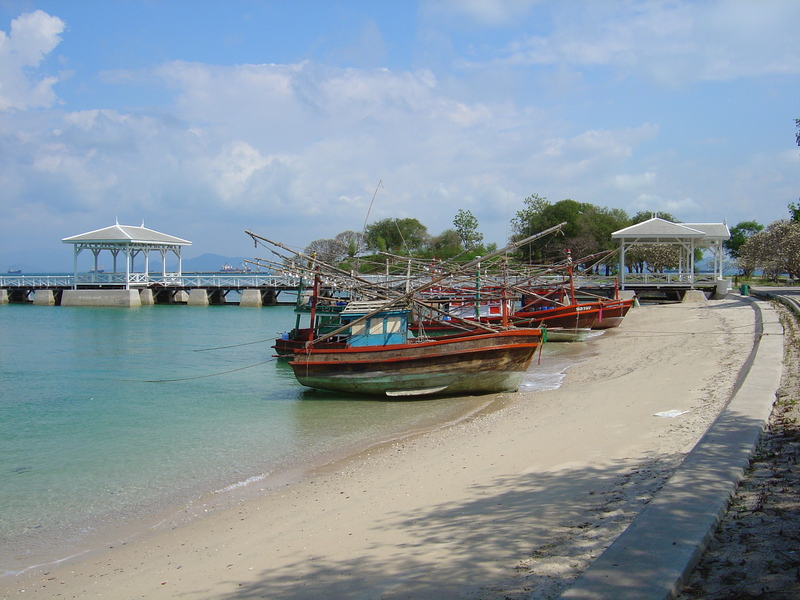 Ko Sichang is located in Chonburi province, and lies just off Si Rachaa (slightly North of Pattaya). Its population is about 5,000 and total land area is only about 17 square kilometres (I suspect this figure includes the surrounding smaller satellite islands). You can fully circumnavigate the island in a day and easily walk the length of it in a couple of hours. The island serves primarily as a customs office catering to nearby shipping and there is also a university on the island that concentrates on marine biology. The island is famous to the Thais because each of Kings Rama IV, V and VI used to come to the island as a retreat. 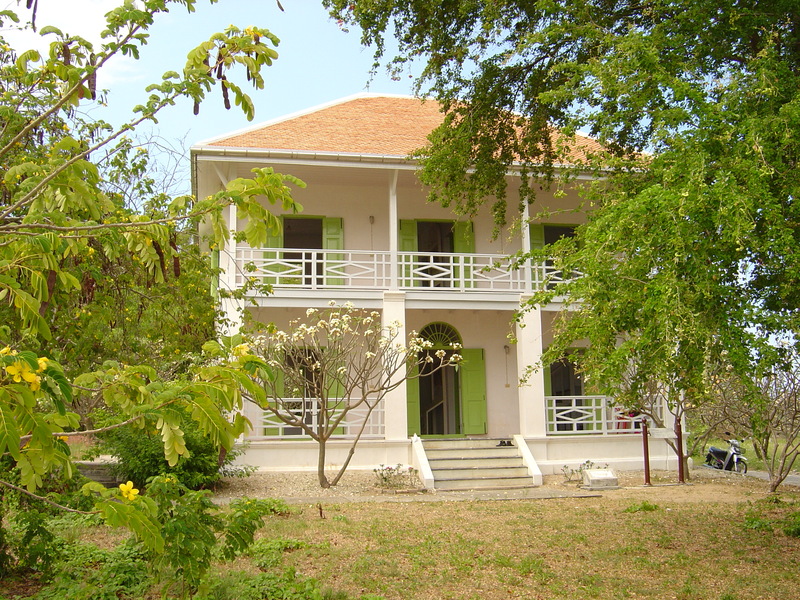 In fact, King Rama V built a beautiful summer palace on the island and used to meditate in secluded limestone caves within the island’s hinterland. As mentioned, the island serves as an important customs point for shipping in the area. In fact, this function has been going on since at least the early 1800s and it was such a popular stop for international shipping at the time, that the island was often referred to as “Little Amsterdam” due to its popularity with ships from the Dutch East India Company. In 1893, the Thais temporarily abandoned the island (including King Rama V’s summer palace) to French forces during Thailand’s war with France over the ownership of Laos. The French used the island as a staging post for the war, and ultimately blockaded shipping from entering the Chao Phraya river towards Bangkok. Due to lack of any allies, Thailand ultimately relented and gave Laos to the French, causing French forces to depart the island and Thai waters. 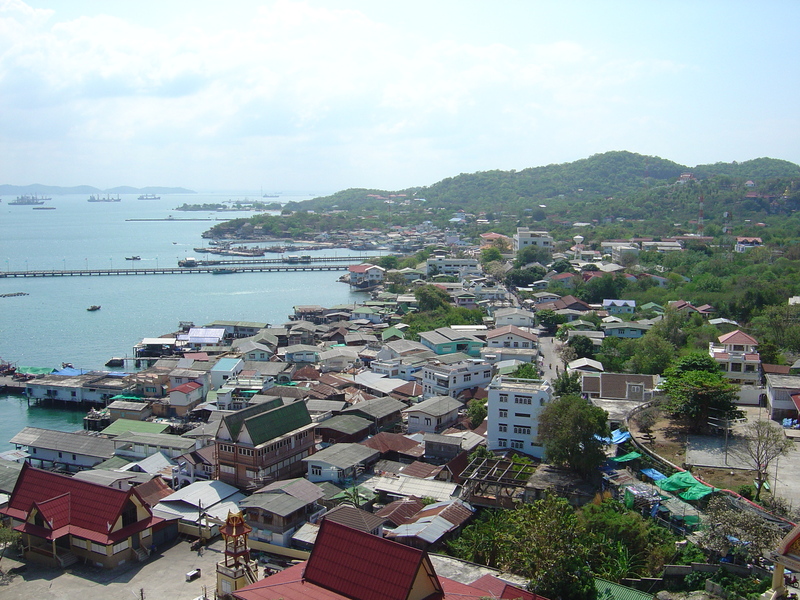 Ko Sichang was also used as a staging post for hostile forces on at least one other occasion, during World War II, when the Japanese occupied Thailand. The Japanese had sailed into several key areas along the gulf of Thailand, while Thailand was silent as to whether it intended to ally with Japan or declare war. Ko Sichang was one of the main staging areas, particularly in preparation for an assault on Bangkok. On December 8, 1941, the Japanese commenced their attack, and following a few hours of fighting, Thailand agreed to ally itself with the Japanese. I hope all this history has piqued your interest about this exotic island! Well, Ko Sichang is not a large island, like Phuket, Ko Chang or Ko Samui. However, for its size, there is quite a bit there to keep you occupied for a day or two. 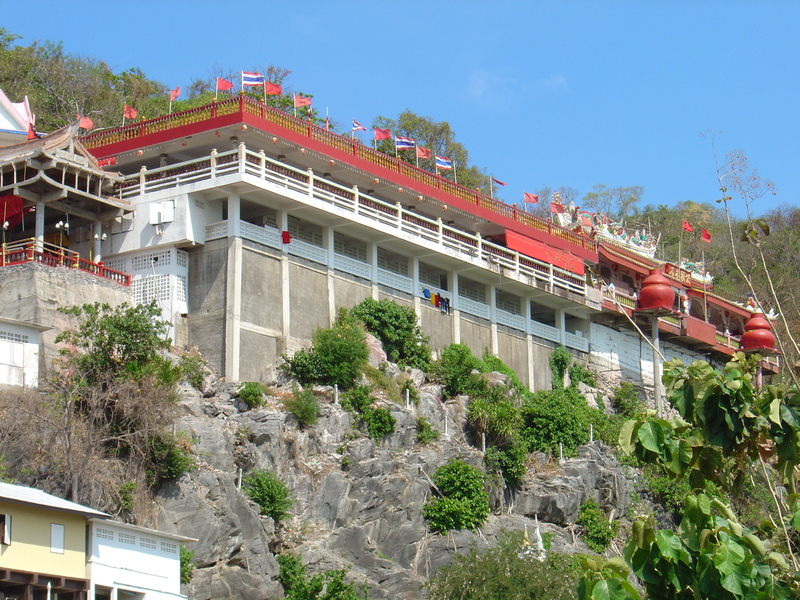 The first thing you will notice when your ferry docks is the gorgeous large Chinese temple built up on the cliff. This temple is known as Saan Chao Por Khao Yai (Shrine of the Father Spirit of the Big Hill), and actually has shrines built into caves in the mountain. This is the oldest temple on the island and goes back to the days of Chinese junks sailing to Thailand to trade ceramics for silk. This is a significant temple to the Chinese Thais and on Chinese holidays, this place becomes packed as tens of thousands make the pilgrimage over from the mainland. On the other (South) end of the island is the location of King Rama V’s summer palace. After the French occupation in 1893, the King had the palace dismantled and moved to Bangkok, where it is was renamed as the Vimanmek Palace (you can visit this in the Dusit district of Bangkok). The concrete foundations of the original palace can still be seen and in addition, the various other houses of the complex, such as the houses of the King’s wives, are still intact. 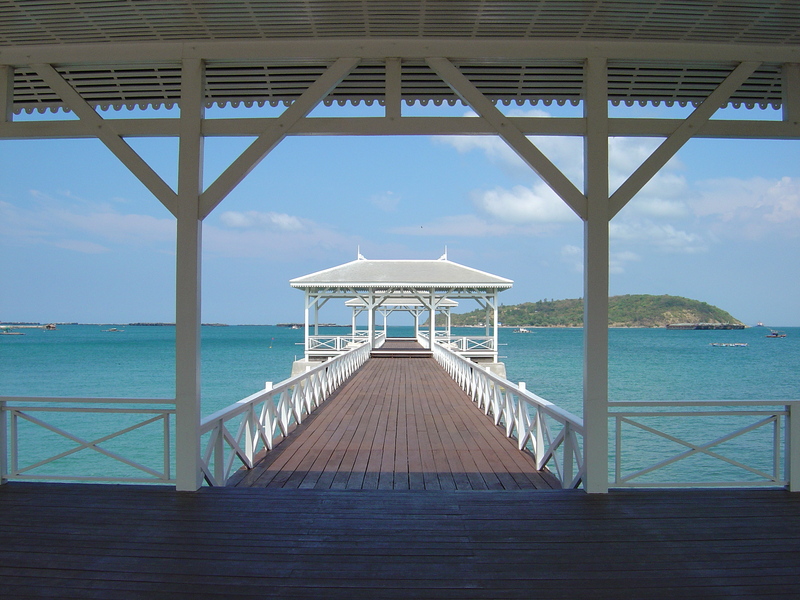 The Royal Boat Pier and Royal Gardens are also still there. 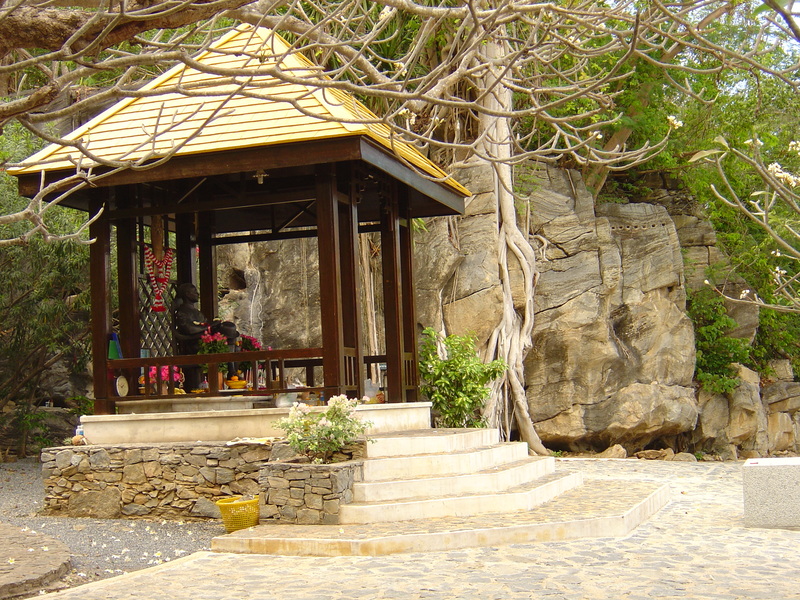 Going into the hinterland of the island, you will find the Wat Tham Yai Phrik meditation centre. This is a full Buddhist community where everyone works, and strives to attain nirvana via regular meditation. Visitors are offered a tour of the facility, which includes various caves for meditation (including the cave where King Rama V used to meditate). 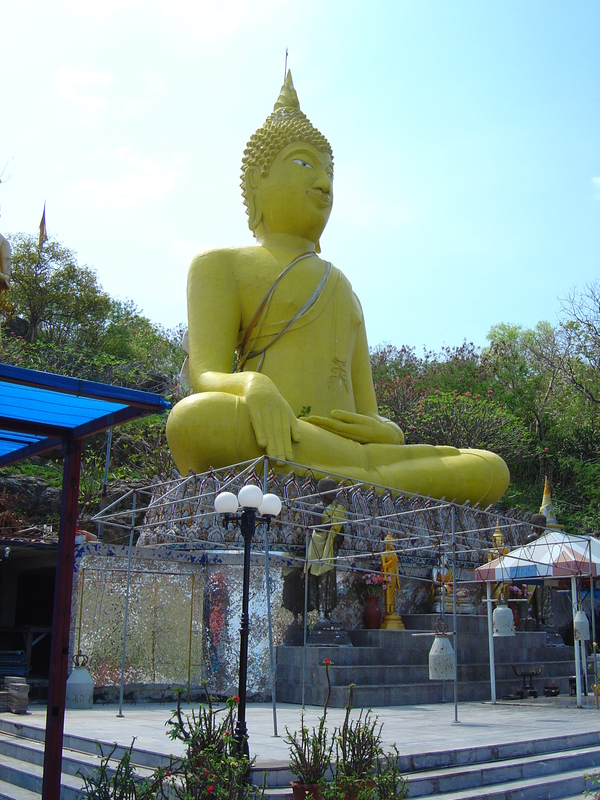 The Big Buddha (also known as the Yellow Buddha) is located in the centre of the island, just inland from the main town. You can walk up the hill yourself (although it is easy to accidentally walk past the turn-off). Alternatively, take one of the tuk tuks. The statue itself is interesting, and you also get some nice views over the island. Dracula’s Castle… I am sure I have your attention now. Yes, there is a large Moroccan style castle in the middle of the island (up on the hill), that looks unfinished and very much fits what I would imagine Dracula’s Castle to look like. This place was designed and built (although never completed) by a US architect. It was intended to be a hotel, although main building was never completed and instead, some of the smaller surrounding buildings eventually became a guest house (Malee Blue Guesthouse). This is a great place for photos and I bet your friends will never believe the photos were taken on an island in Thailand. The main town is a tourist attraction in itself and is a nice place to stroll along. There is a single main road that goes from North (the pier at the foot of the Chinese temple) to the South (where it intersects with the original pier (mostly for fishing now). As I stroll through and look at the old wooden Chinese shop-houses, I like to imagine what this place was like back in the 1800s, when you had drunken sailors from the four corners of the globe staggering across these streets, fighting, boozing, whoring, cheating, trading and smuggling. If you want beaches, well, this isn’t the best island for that. The area around King Rama V’s summer palace is probably the better option, although do not expect to find tropical scenery that you see in Krabi or on Phi Phi or Ko Tao. Really, this island is more for its sites and history rather than swimming. If you really do have a hankering for some nice beach photos or coral reefs, then hire a boat to go out to one of the neighbouring islands. From Bangkok, go to the Eastern (Ekamai) Bus Station on Sukhumvit Road and catch a bus straight to Si Rachaa (about 120 baht). From the Si Rachaa bus stop, catch a taxi or tuk tuk (or walk if you feel like a bit of a stroll) down to the ferry pier, where you can catch a ferry (between 6am to 8pm) for 60 baht each way. If you want to get there from Pattaya, there is a songtaew running along Naklua Road that goes to Si Rachaa (white songtaew from memory… get the one heading North) or else stop a bus or songtaew on the Sukhumvit Highway and ask if they will pass Si Rachaa. I found a pretty good map at http://www.ko-sichang.com/islandmap.html. When you arrive by Ferry, you will find a bunch of tuk tuk drivers (on old style, large motorbikes with big Nissan diesel engines) waiting to offer you passage. I generally prefer to walk, at least initially, and then hire a tuk tuk a bit later when I want to get to some of the more distant locations. Pricing is entirely by negotiation, but expect between 60 to 100 baht per hour. You can also rent your own motorbike in town for about 400 baht per day. If you are hungry, then head back into town, where you will find a bunch of different restaurants scattered around. Most serve Thai food (including good, cheap seafood). If you want a more international menu, then check out one of the small hotels or guest houses. Also, try Pan and David’s Restaurant, which is just before the Rama V Palace entrance. For accommodation, most places are located in town or just on the periphery. The most expensive place is Paree Hut (isolated on the other side of the island) which charges about 5,000 baht per night. Everything else is about 1,500 baht per night (or less) and the one place that I consider to really be worth mentioning is Charlie’s Bungalows in the middle of town (a bit South from the Chinese temple and main ferry pier). Good food, well maintained and attractive rooms, all for only 1,000 baht per night. If you want picturesque tropical beaches with palm trees and squeaky white sand, then Ko Sichang is not the place. Instead, you will need to travel a bit further away from Bangkok to get that pure beauty (and the limestone rich waters of the Andaman sea are a better bet for such photos). However, if you want an island that is jam packed with history and great photos of temples, banyan tree roots growing into rocks, limestone caves, and Dracula’s Castle… then check this place out. It’s easy to get to and offers a great day trip away from Bangkok or Pattaya.